first of all, and try to not even think about how long it has to be. In order to get to your page length requirement, if you really need to do that, I have some advice for you too on that. Use copious research notes. So you’ve got a term paper that obviously means you have to researching your topic. So use as much from other people as you can. But use it in a smart way. Don’t just you know, take a huge paragraph from a source and paste it in because you know it’s important and you just have to get the pages in. Once you put that big block of text into your paper, you can actually create an entire page of your own thoughts off of that citation. This is where professors really enjoy seeing citations is when you’ve written something in there from another book that you think is important and then you give your own thoughts about it. The most important thing is to always be giving your own thoughts about things that you put into your paper. So you can actually get a lot of mileage with citations. Even more than just pages. Number two, you can insert a really strong opinion into the essay. 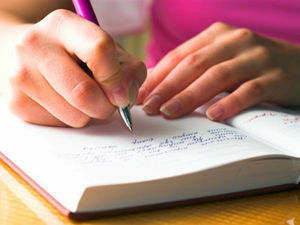 Make your essay as strong willed as possible. Really try to push your point at every point possible. Try to make it interesting for yourself to write. Number three, since you are doing this overnight, please take time to eat, and pause and take, even if you’re getting stuck I would say give yourself time to just sit down and think about the topic and think about where you need to go with it. And give yourself a moment to breathe because it can get very stressful when you’ve got a deadline in the morning. Also, you can think of it as writing two five page essays to put together. So you can sort of break it up for yourself. So your ten pages doesn’t get, you know, so bogged down with you. So if you say, if I finish this part of my argument by page five, then I’m pretty good to go and I think I can do until page eight and then I think I can add my citations page and have nine pages. So. Hopefully your professor is a forgiving person like I am, anyways, when I grade papers. But if he or she is not, really, just try to push your citations, push your point, and sleep when you’re finished.